This is for one New Tru Triple Slow Cooker. 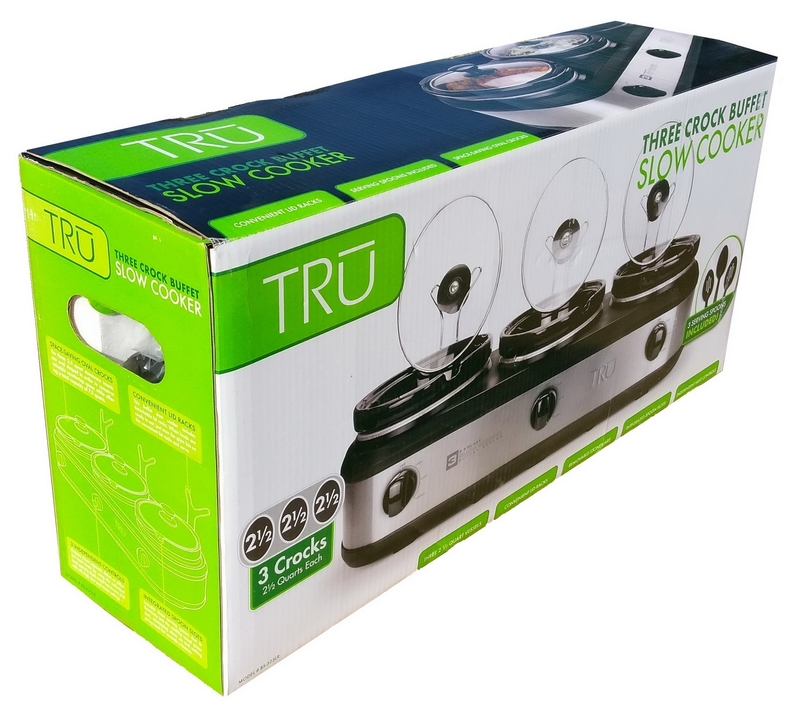 This Tru 3 Pot Slow Cooker Buffet Warmer Server. Enjoy a complete meal preparation and entertaining solution with the Tru Cook & Serve Slow Cooker. You receive 3 separate stoneware heating pots and a heating base with individual temperature controls, so you can serve a main dish, a side dish and an appetizer or dessert side by side and keep them all warm at once. This set promises to be a hit at your next dinner party, family gathering or company event. This Triple Slow Cooker increases your versatility in meal preparation, and looks good in any kitchen. It cooks up to 3 different dishes at the same time, saving you time and freeing up your stovetop to cook additional dishes. Set it and go, and come back to up to ready-to-serve dishes. It uses less energy than a stovetop cooker and features dishwasher-safe stoneware pots and tempeSilver glass lids that make clean up easy. The sleek design brings elegance on your countertop and to your gatherings of family and friends. Cleaning is a breeze with dishwasher safe parts and the Tru 3 x 2.5 Qt Triple Slow Cooker includes 3 lid rests for your convenience in serving. Beautiful Silver finish. Three 2.5 quart oval stoneware pots are dishwasher safe. The Tru 3 x 2.5 Quart Triple Slow Cooker with Lid Rests is the perfect slow cooker for entertaining guests at a holiday get together, a party, or just with family and friends. Unit dimension are 28.5" x 8.58" x 13.82"